Smart Media offers a unique in store media mix throughout the shopper journey, culminating in a 360-degree approach with the shopper always top of mind, from front of store, within category and at point of purchase. Exemplifying our philosophy of taking branding, to buying! Over 800 000 people pass by your shop front window every month. 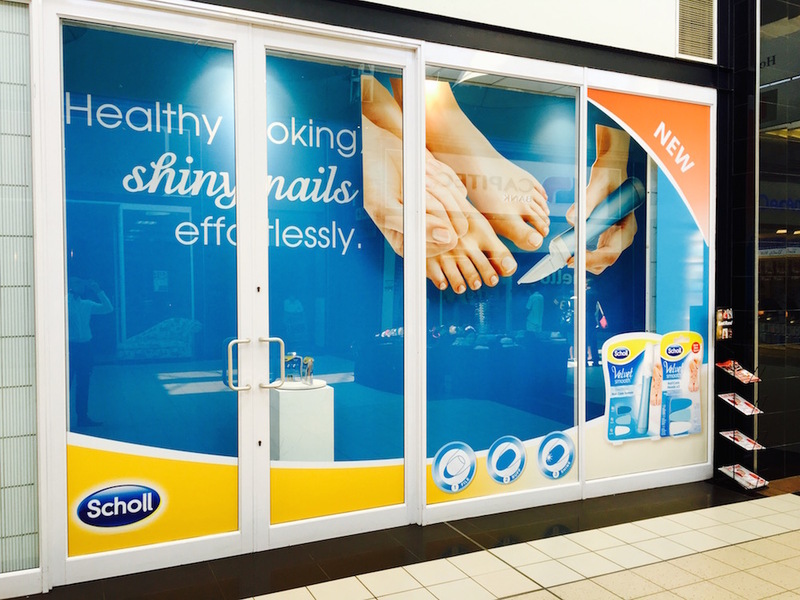 Smart windows are different – they can be tailored to display your highly impactful solution to create a big brand presence. We are experts in visual merchandising and use creative designs and customised environments to the layered backgrounds to bring your brands to life. 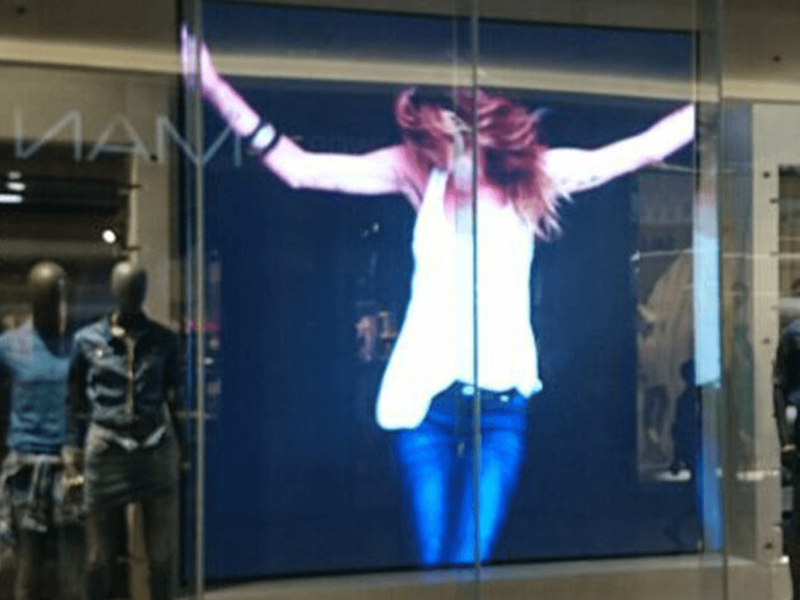 Digital Display screens are available throughout the store, saving in production and flighting costs, ultimately reducing your brand’s ecological footprint. Real time artwork and creative updates mean efficient lead times as well as the opportunity to display rich content that is eye-catching and interactive, leading to intense customer interest and product scrutiny. The next mind-blowing, awe-inspiring big thing. A new channel of high impact communication, networked displays, full HD visuals and wireless content management. You plug it in, turn it on and blow your customers minds in store! Every angle, any image, all the impact! 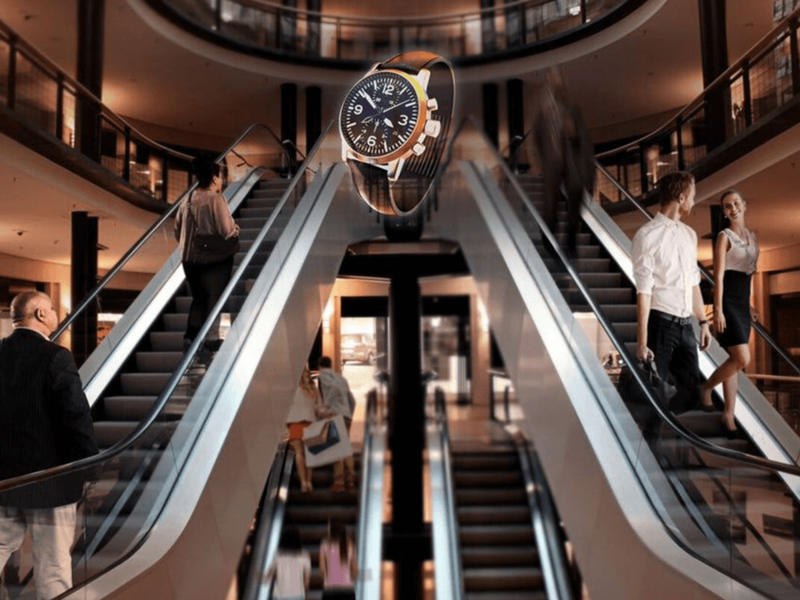 Smart Holograms are an eye-popping, jaw-dropping, head turning innovation guaranteed to create the ultimate buzz around your brand and attract your customer’s undivided attention in store. Upon entering any Dis-Chem store nationwide, customers will notice yet another Smart Media Touchpoint. Our barrier sleeves also known as “Beepa Sleeves” are another sought after advertising opportunity that generate high sales and intense and impactful brand awareness, these can be fully customized according to your campaign messaging and competitions tend to perform very well in this area. An opportunity to be noticed in a space that has tremendous footfall and presence. We offer both standard and unique Basket and Trolley advertising opportunities providing brand-in-the hand intimacy on mediums which travel throughout the store with the shopper. Both the inside and outside of trolleys and baskets offer mobile media spaces that can be used to trigger buying decisions for both the customer using the trolley or basket and the shoppers that they pass. 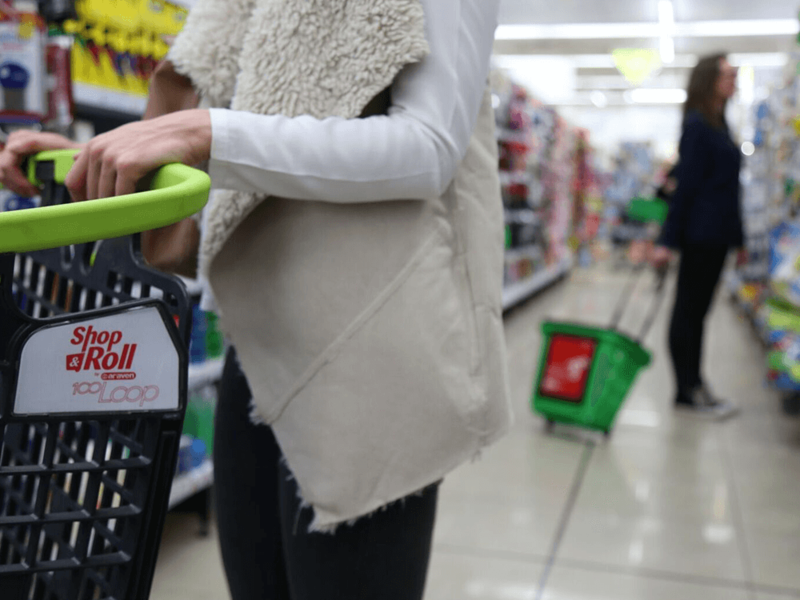 Our luxury Shop&Roll wheel baskets and Loop Carts offer a comfortable shopping experience, increasing average basket size and extending time spent in store. Customer decisions often play out at the retail shelf and capturing your shoppers’ attention in those final few moments when pausing at your category can significantly improve shelf performance. Smart Media’s innovative Digital Video Shelf Strips offer campaign specific eye-catching movement directly on shelf. We can customise your message making use of your existing TVC or highlight your product’s USPs with exciting visuals. Digital movement in the aisles will easily attract the attention of consumers and can be booked exclusively for your brand in its category. Our two-way arches are strategically placed in store to create maximum brand exposure amongst a captive audience, and are guaranteed to increase your brand and product credibility in store. 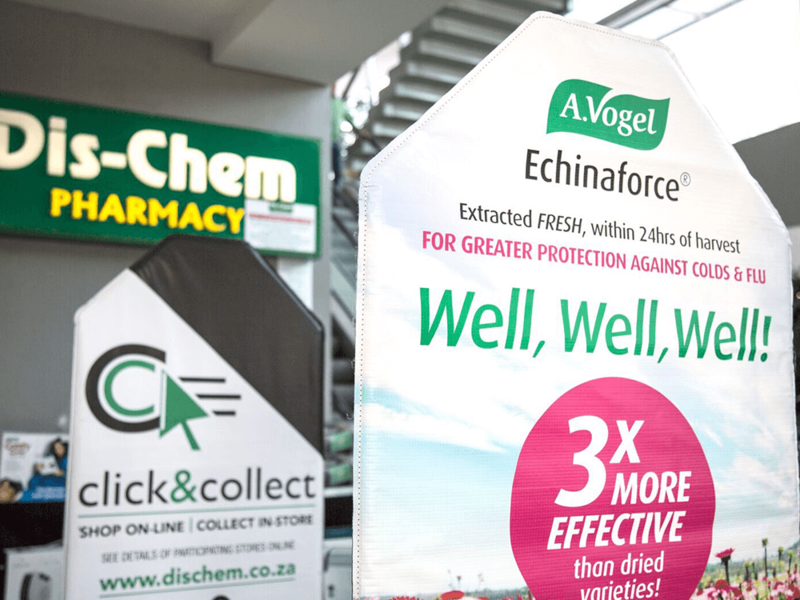 Proven to be highly successful amongst advertisers in this area, our Poster Arches create top of mind awareness as well as trust for not only customers, but pharmacists as well who spend their day viewing the reverse-side of the arches. Over a million customers a month wait on average 14 minutes to be served at Dis-Chem’s Dispensary area across the nation. This sought after media opportunity offers exclusivity, prime positioning and is available in more than 70 stores across the country. Many of these units are illuminated from behind giving your brand high impact exposure during focused customer dwell time. Offering prime presence at the Self-Medication area where an average customer spends approximately 5 minutes at the counter. Smart Media’s Over The Counter Digital Screens offer eye-catching impact with low production and flighting costs. 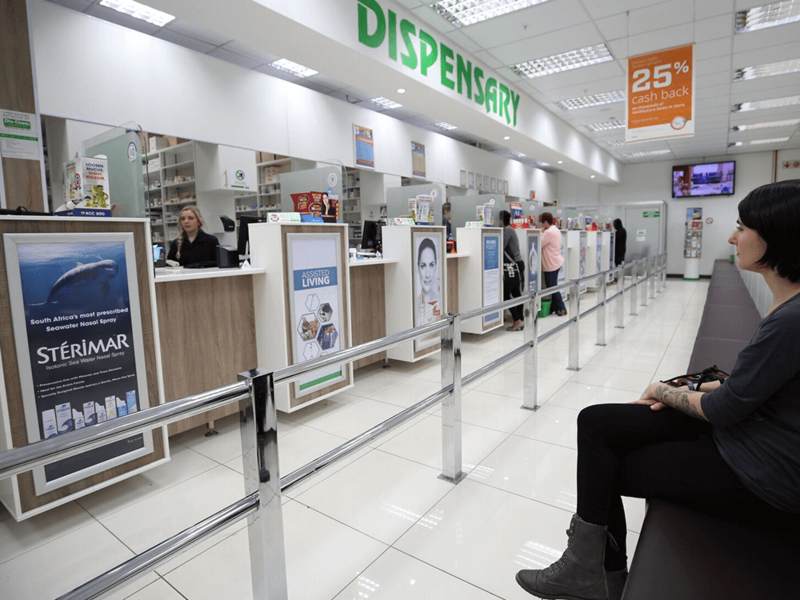 This invaluable space offers top-of-mind awareness for both the customer and pharmacist. 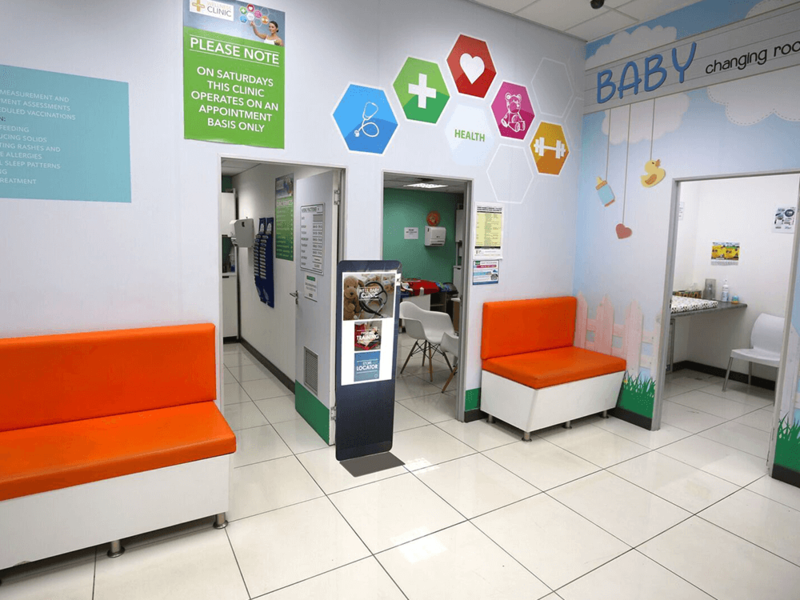 As Clinics cover a variety of services, particularly around seasonal wellness, general health and baby care this highly impactful medium delivers interactive and engaging exposure while attracting the undivided attention of customers with specific needs. 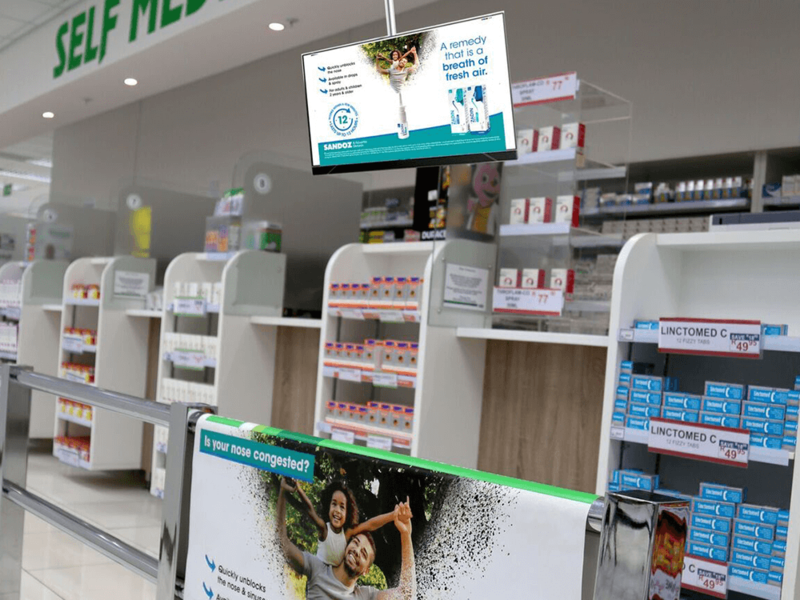 Advertising in this area creates positive brand awareness, consistent presence and interactive exposure while customers wait to be seen by a nurse. Associating brands with innovative technology which reduces lead time as well as production and flighting costs. 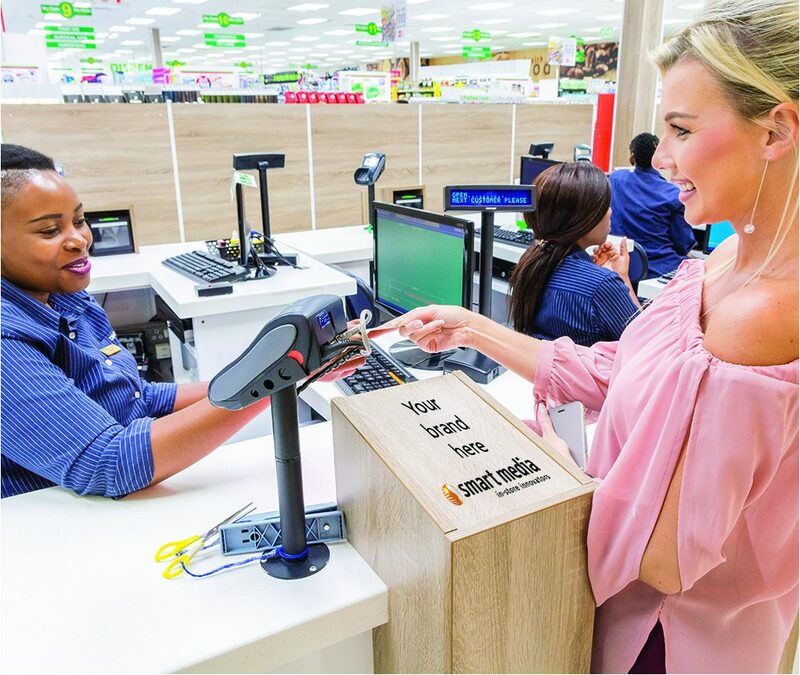 There are two touch points at the till – Pole Cards and the Till Point Signage. These prime spaces offer incredible brand presence at Point Of Purchase and are ideal for the use of rewards programs, 3rd party partnerships, promotions for any snake-aisle goods and financial institution product offerings. These powerful mediums offer prime opportunity to communicate with consumers directly when wallet is in hand. Now, what can we do for your brand?